What is a Maine Sublease Agreement? Maine Sublease Agreement: What Is It? A Maine sublease agreement is a form of lease that is not between a tenant and a landlord but between a tenant and another tenant. 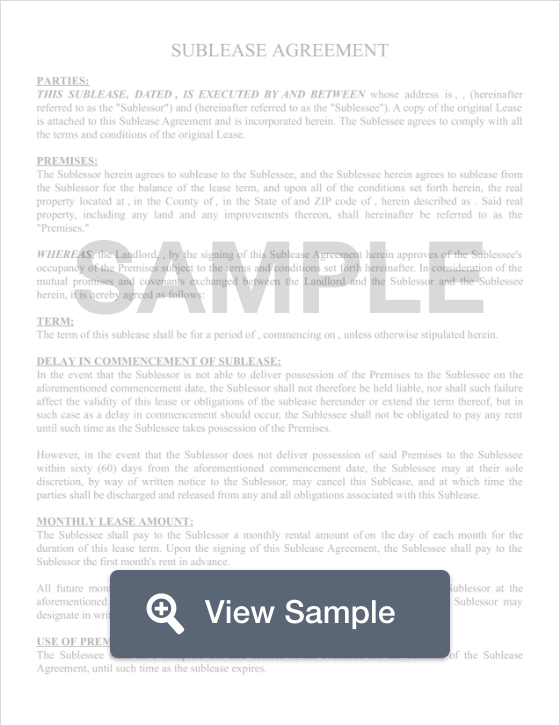 In this type of agreement, the original signer (a sublessor) of a residential lease finds another tenant to take his or her place (a sublessee). This means that the sublessee will move into the rental, paying rent and abiding by the rules of the lease just like the original sublessor would. These types of agreements are usually for a short period of time, providing a level of flexibility for the sublessor and sublessee. Sublessors usually implement these types of agreements when they need to leave town for a period of time, or have found permanent housing and need someone else to finish out the lease on their behalf. One important fact about a sublease agreement is that the sublessors name will remain on the lease throughout the agreement. This means that if the sublessee fails to pay rent on time or damages the property, it will be the responsibility of the sublessor to correct any damages. Maine’s sublease laws indicate that a sublessor must have the landlord’s permission before entering into a sublease agreement. Most likely a residential lease agreement will indicate that the tenant must have the landlord’s permission before subletting the apartment.